TADHack has been running for less than two years, and in that time we’ve had over 200 amazing hacks created at the events, tens of which have gone or are in the process of going commercial. At the end of this weblog we list them out so you can see all the impressive concepts created from scratch or enhanced over 24 hours. Some recent hacks are in TADMentor, being nurtured for market launch. This weblog aims to help understanding TADhack is much more than simply a hackathon, its focused on growing the telecom app development ecosystem. How best to describe a TADHack weekend? Its a journey of discovery, its team building, it has immense highs and occasional lows (usually accompanied with ‘why isn’t this working?’), pressure, networking, fun; meeting great people who are motivated, genuine, and accessible; everyone is focused on sharing their experiences, helping each other, and of course the common goal of the pitches. All hacks are inspirational, and have amazing personal interest stories behind them. You’re left uplifted, educated, and new friends you hope or plan to work with. After each event we create professional collateral to promote your hacks, and people are contacted about those hacks and potential business. 10AM people start arriving, getting to know you, quiet banter. 11AM most people have arrived, the ice is broken, people are discussing ideas, understanding technologies, and the noise level jumps up considerably. 1-6PM – quiet, people are settling into turning their ideas into reality, getting to know the SDKs, and setting up environments. 6-8PM people start to break, relax as they can see what is required to complete their hack, and start to network again discussing joint business opportunities while others continue in quiet concentration. 8PM wrap-up some leave with the look of a long night ahead, while others are ready for a drink. I remember at TADHack Lisbon in June 2015 coming back to the hotel we were staying at and seeing one dedicated hacker at a table in the bar with their computer, Intel Edison board, several other devices, and a drink on the table hacking away. We kick off the pitches normally by 2PM. Usually most people want to go later in the running order, usually there are a few that are ready to go first or we kick off with the remote pitches. Just because you can not travel to a TADHack location does not mean you can not take part, we accept remote pitches. Pitches are the great reveal, the ideas and applications are always interesting and stimulating. It shows the importance of getting the message out to as broad an audience as possible to understand the power of adding telecom capabilities to application, services and business processes. We try to spread the prizes as widely as possible, even if do not win a prize there there is often a business follow-up on the ideas. We then wrap-up the weekend with some drinks and snacks to congratulate everyone, and the discussions move onto next steps. 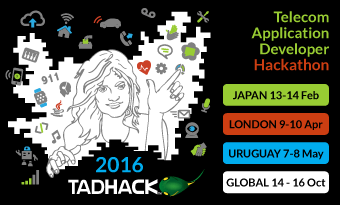 Analysts, people interested to experience the journey of discovery over a TADHack weekend. First-timers coming in to chat, learn and see what a hackathon is all about. Building confidence to hack at their next event. Networking – a comment many people, “I met such amazing, cool, fun, and accessible people.” You’ll make new friends. TADHacks will run and run. It is becoming how people understand services and technologies. Not through weak-minded marketing that plagues most industries. But by experiencing first-hand, internalizing to your specific situation, and then applying with the contacts and friends you’ve built over an intense weekend. Yes I know its a weekend, but its the best 2 days of training and fun you’ll get Before each event I always recommend Tim Panton’s article on how to prepare for a hackathon, it will ensure you get the best from the weekend. Moos project Ibrahima GAYE Telestax MOOS, is a platform build with components from TELESTAX products (RESTCOMM, Ussd/Smsc GW & JSS7 and Jdiameter ). 1. to aggregate the access code from multiple Telcos and provide to the subscribers and resellers a uniq groupe of service access code that works for all Telcos in the country. with low-cost, innovative technologies and tools.